The challenging and visually stunning backbone trail. Photo: Facebook. Escape from the urban chaos and experience the beauty of L.A.’s nature. 2019 arrived with the sort of swiftness that makes you wonder if 2018 really happened. With a new year comes a fresh start and resolutions that will hopefully help us in our journey of becoming better versions of our 2018 selves. Resolutions are as different as the people who make them and range in everything from giving up smoking and drinking to reading more. However, year after year, without fail, the ost common New Year’s resolution is to live a more active lifestyle. For those of us fortunate enough to live in California, the pleasant climate nearly year-round offers the perfect backdrop to getting outdoors more often and fulfilling those resolutions. People in California love to hike, and it’s no wonder with the endless supply of hiking trails in nearly every nook and cranny you could think of. With the help of Venice resident Jackson Rayfield and the Senior Chapter Director of the Sierra Club Los Angeles, George Watland, here’s your insider’s guide to four of the best hiking trails the Westside has to offer. North of the Pacific Palisades and East of Topanga Canyon rests over 11,500 acres of the Santa Monica Mountains that make up the picturesque Topanga State Park. “There’s a whole network of trails up on in Topanga Canyon and they are really quite enjoyable too,” Rayfield continues. “Their trails are wider and eventually lead you to this beautiful rock that looks a ton like Pride Rock from ‘the Lion King’. It’s got a nook of caves nestled in the side of it. The trail I walked that led up to Eagle Rock was probably about two miles from where you park your car to where you walk up the trail, and it was really beautiful.” Topanga State Park offers a variety of different trails and vantage points including the Parker Mesa Overlook, which offers an unforgettable view of the Pacific Ocean, Skull Rock, Los Liones Trail, and the Santa Ynez Falls. In the case of Sycamore Canyon, it’s ok to chase waterfalls. The right trail will lead you to a breathtaking waterfall straight out of a Hollywood movie. “It has a whole network of trails,” Rayfield explains. “I found myself walking along the mountains at the top ridge that had a straight drop down to the PCH. It was straight on-looking PCH beneath you and the ocean just beneath that. And there’s this great little rock that’s almost like a little presentation deck and it’s just you, king of the mountain, overlooking the ocean. It was one of those moments where I thought, ‘You’re doing alright. Whatever it is you’re going through right now, you’re doing alright.” Three miles into the hike take a lunch break and catch your breath at Danielson Ranch group camp. 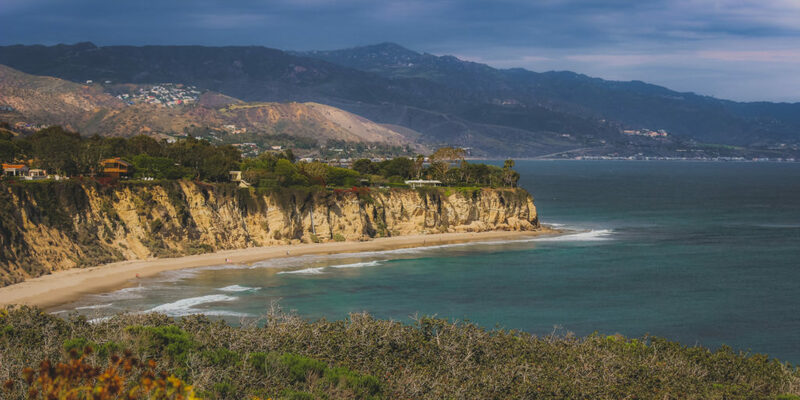 Whether it’s overcast or a clear day, Point Dume offers yet another beautiful view of the ocean. What makes Point Dume so unique is that a great deal of the trail leading to various vantage points as well as the ocean below are lined with yellow wildflowers that bloom in spring and take your breath away. It’s a moderate hike and for those who like a little walk on the wild side, you can climb the rocks and sit precariously overlooking Malibu’s beautiful landscape. Visit https://angeles.sierraclub.org to learn more about their organized hikes and how you can join.